The Viking swings his axe and you backpedal furiously, swapping your bow for your sword in time to parry his next swing. The blow after that bites into your arm, but you’ve delayed the warrior long enough for one of your Saxon brethren to arrive. He stabs your enemy in the back and the Viking falls to his knees. You raise your sword for the finishing blow. Unfortunately it takes three tries to get your aim right because your sword keeps bouncing off the rocks beside the fallen Viking, and in the meantime an arrow from someone you never see – possibly another Saxon who hasn’t realised you’re on the same side – takes you down. Then you respawn in the middle of a group of enemies who decapitate you instantly. Then you respawn again, in time for the server to collapse and boot you back to the menu. You have been playing War Of The Vikings. 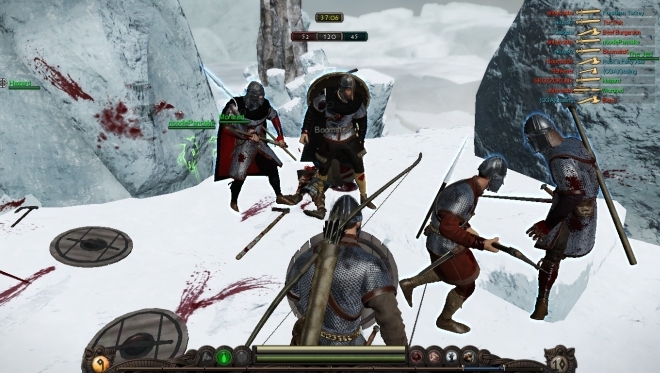 From the same designers as War Of The Roses, War Of The Vikings is an online multiplayer game of hand-to-hand combat, a chaotic melee of medieval people-slicing. It’s all about getting your sharpened lump of metal into the other guy before he does the same to you. To give its sword-stabbing and axe-swinging a sense of heft and weight, you attack by left-clicking and moving the mouse in the direction you want to attack from, and parry by right-clicking then mousing in the same direction as the attack. The intent is that swiping your mouse should feel like swiping your weapon, but the mouse also moves your viewpoint. It feels like your weapon’s attached to your nose and you’re flailing your head about to attack. After some frustrating deaths I figured out how to make movements small enough that I wasn’t disoriented by every blow, though those precise motions no longer felt like satisfying slams of an axe. There are three classes to unlock, because of course there are. 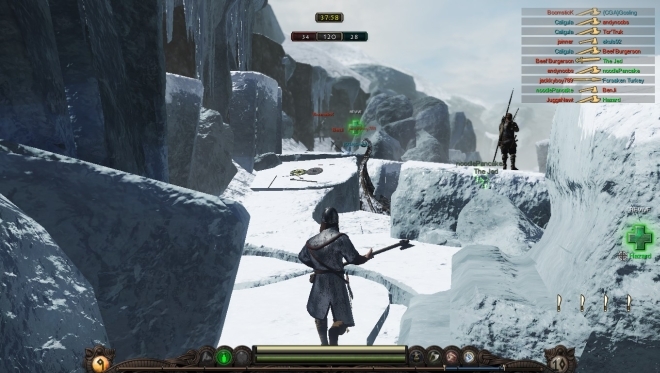 Multiplayer games that make you play with a limited set of toys before you’re allowed access to the full set are de rigueur now; in War Of The Vikings you begin with sword and shield before getting a bow and then a two-handed axe, and then the option to create custom classes using the full set of spears, throwing daggers, and so on. 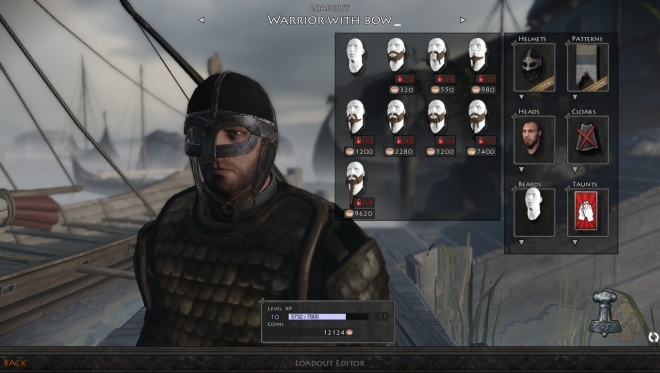 Saxons and Vikings both have access to the same weapons, but differing visual options. Importantly, there are multiple different beards to choose from. To shoot the bow, you hold down the right button to aim, and left-click to shoot, with a timer to prevent you just holding the string back all day long. What makes shooting hard is the way players sometimes warp around and arrows occasionally fly through them without causing damage. Like in War Of The Roses, lag is a big issue – if you’re playing in Australia especially, although even in America they’re complaining about it. I hope you like whichever game mode the nearest server keeps on rotation, because you’ll rarely get to try any of the others. While archery’s useful on larger maps, several tiny maps make it redundant. Charging in swinging and hoping you don’t accidentally kill a team-mate is all you can do in these messy, cramped brawls. These maps also highlight the terrible spawning system – in War Of The Roses you could choose to spawn with your squad leader or at certain points on the map, but here you’re thrown back into the fray randomly, often in the middle of opponents. Your friends may not be much safer to be around. 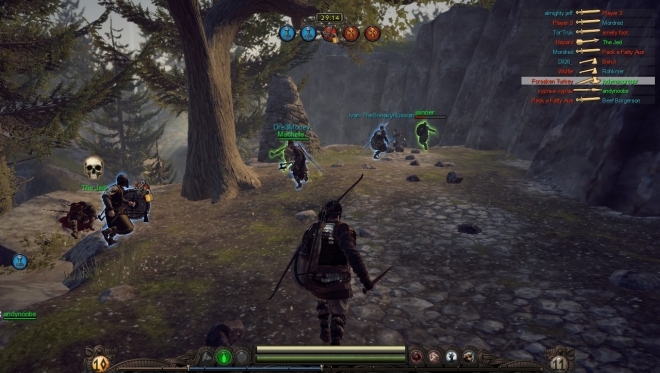 The tutorial’s abrupt and doesn’t teach you how to dodge, bandage, or realise different-coloured warriors are members of different squads on your team rather than enemies. 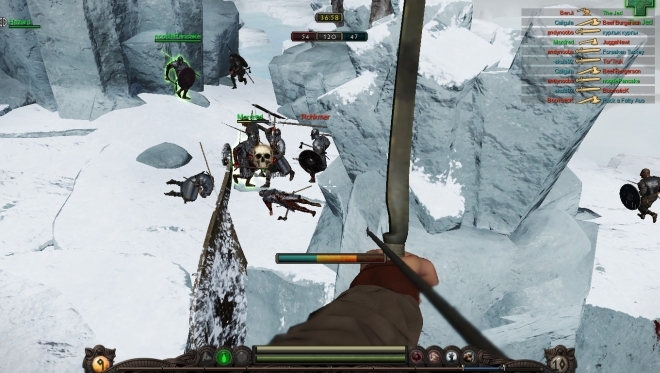 New players attacking team-mates is a common sight, and even those who’ve paid enough attention to the loading screen to know how dodge works don’t know how to tag – pressing T outlines the enemy you’re looking at, making them visible even through cover, which is a blessing for archers or warriors with throwing axes and daggers. Or it would be if people did it, but almost no one does because that info is hidden in the keybinding submenu. When you’re in the thick of an evenly matched fight, War Of The Vikings can be thrilling. You hear your team-mates speak in English as they shout battlecries or warn of arrows, but the enemy are voiced in their own language – the Vikings in Icelandic, and the Saxons in Old English. Hearing warriors screaming as they attack immerses you in the battles, but the rusty netcode constantly pulls you out of them, either with horrendous lag or by yanking you out of a match and back to the menu for no reason. Competitive multiplayer games can be hard to criticise because the response is always the same: “It’s your fault for not being good enough.” But I don’t feel like I’m bad at playing War Of The Vikings; I feel like I’m barely playing it at all. I can see what it would be like to play, but through a thick sheet of glass I’m on the wrong side of.